We recommend checking out our discussion threads on the NEC EA305WMI-BK-SV 30" Widescreen LED EA305WMI-BK-SV, which address similar problems with connecting and setting up Computer Monitors NEC. The user manual for the NEC EA305WMI-BK-SV 30" Widescreen LED EA305WMI-BK-SV provides necessary instructions for the proper use of the product Computers & Solutions - Monitors & Displays - Computer Monitors. 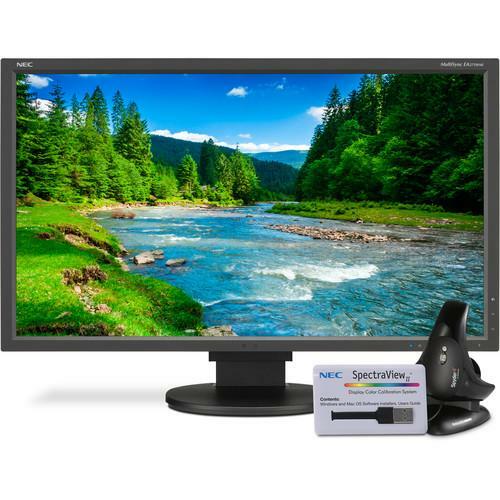 With a built-in ambient light sensor and support for XtraView+, the EA305WMI-BK-SV 30" Widescreen LED Backlit IPS Monitor with SpectraViewII from NEC automatically adjusts to the lighting conditions while making it easy to see the display from wide angles. With an in-plane switching (IPS) panel you benefit from 178° horizontal and vertical viewing angles which reduce distortion, making it possible to view the screen from nearly any angle. 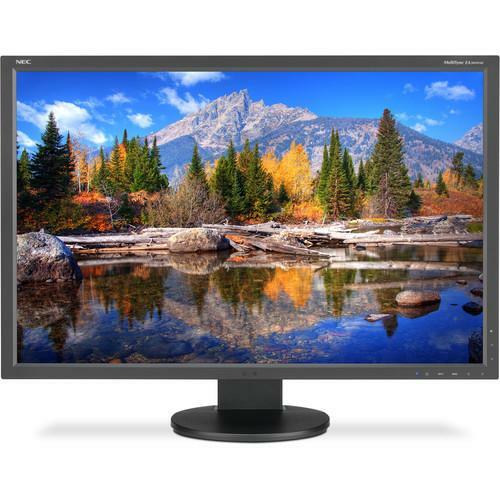 In addition to enhanced viewing angles, content being viewed on this display is depicted clearly and accurately thanks to the 2560 x 1600 resolution, while the 1,000:1 contrast ratio supports darker dark and brighter bright colors. 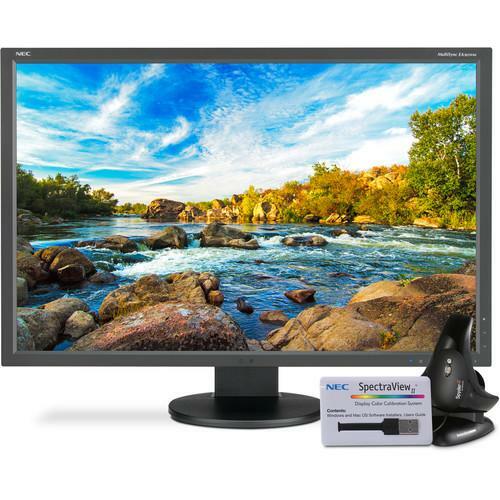 Included with the NEC EA305WMI-BK-SV is the SpectraViewII software and the Spyder5 color sensor. This color calibration sensor, when used with the included software, helps to provide accurate color representation with automatic calibration. You can also choose from a variety of presets to suit the specific content being viewed on the display. Connect the EA305WMI-BK-SV from NEC to a variety of computer configurations as it comes equipped with DisplayPort, DVI-I, and HDMI connectors. Touch sensitive OSD controls simplify the process of adjusting various aspects of the display such as brightness, resolution, and more. Once configured, the quick-release stand allows the monitor to be tilted, swiveled, pivoted, and the height can be adjusted for enhanced viewing comfort. If you own a NEC computer monitors and have a user manual in electronic form, you can upload it to this website using the link on the right side of the screen. The user manual for the NEC EA305WMI-BK-SV 30" Widescreen LED EA305WMI-BK-SV can be downloaded in .pdf format if it did not come with your new computer monitors, although the seller is required to supply one. It is also quite common that customers throw out the user manual with the box, or put the CD away somewhere and then can’t find it. That’s why we and other NEC users keep a unique electronic library for NEC computer monitorss, where you can use our link to download the user manual for the NEC EA305WMI-BK-SV 30" Widescreen LED EA305WMI-BK-SV. The user manual lists all of the functions of the NEC EA305WMI-BK-SV 30" Widescreen LED EA305WMI-BK-SV, all the basic and advanced features and tells you how to use the computer monitors. The manual also provides troubleshooting for common problems. Even greater detail is provided by the service manual, which is not typically shipped with the product, but which can often be downloaded from NEC service. If you want to help expand our database, you can upload a link to this website to download a user manual or service manual, ideally in .pdf format. These pages are created by you – users of the NEC EA305WMI-BK-SV 30" Widescreen LED EA305WMI-BK-SV. User manuals are also available on the NEC website under Computers & Solutions - Monitors & Displays - Computer Monitors.